Over the years the treacherous waters and rough terrain of Antarctica have claimed numerous lives either in the form of shipwrecks or air crashes. Antarctica is located at the southernmost part of the Earth’s continent. It covers an area of over 5.4 million square miles. Approximately 98% of the continent is covered with ice averaging 6,200 feet in thickness. Antarctica is characterized by several hazards and experienced several disasters in the past that have claimed tens of lives. The disasters have either been man-made such as fires and shipwreck or have occurred naturally such as avalanche, glacier, and volcano. The disasters have happened on land as well as in the waters surrounding the continent. Some of the deadliest disasters to ever occur in Antarctica are outlined below. Wilkes Station was one of the research stations set up by the US during the 1957-1958 International Geophysics Year, which included several nations in a variety of research fields with emphasis on Polar Regions. The US government turned over the station to the Australian government in 1959. In 1961, a contingent of 24 men arrived at the Wilkes Station with the majority being Australians (there were only five Americans). On November 8, 1961, P2V Neptune landed at Wilkes much to the delight of the people who had been in the camp for 10 months without interacting with anyone except one another. The plane had arrived from Mirny. The following morning the plane was to take off to McMurdo. It was fully loaded with fuel on the wings making the plane heavy. The plane burst into flame as it took off killing five of the nine people on board. Philippi Glacier is a 15-mile glacier flowing from the east end of the West Ice Shelf. The glacier was named by ANCA for Emil Philippi who made a scientific observation in the vicinity of Gaussberg. On February 17, 1986, Ilyushin 14M plane departed the Molodezhnaya Ice Station in Antarctica for the Mirny Ice Station. However, unexpectedly strong headwind caused the plan to run out of fuel. The plane crashed into the slope of the glacier in whiteout condition while attempting an emergency landing. All the six occupants of the plane were killed with the plane damaged beyond repair. Initial investigation suggested that the crash was as a result of low visibility and the control of the plane into a terrain. The Ross Ice Shelf is one of the largest ice shelves of Antarctica covering an area of about 188,000 square miles. The ice is several miles thick and appears about 160 feet above the surface of the water. Most of the ice shelf floats and covers a large portion of the Ross Sea and the entire Roosevelt Island. On February 3, 1966, a LC-47 plane that was being piloted by Harold Morris exploded due to intense heat after its wing tip was caught as it tried to land. The landing was made difficult by the poor visibility that characterized the Ross Ice Shelf on that mid-morning. The whole plane except the tail was consumed by fire with all the six members on board perishing. 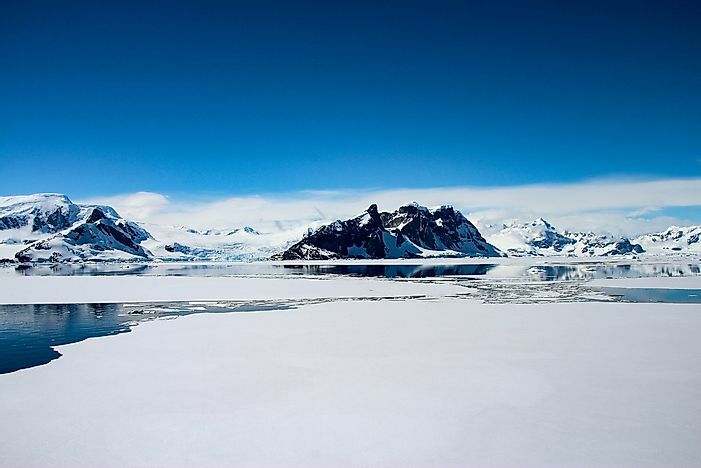 Cape Hallett is a snow free area in the Antarctic. It was the location for the joint research station, Cape Hallett station, between the US and New Zealand during the International Geophysics Year of 1957. The research station was manned until 1964 when a major fire broke out at the station destroying most of the property within and around the station. However, on October 16, 1958, C-124C Globemaster II carrying a crew of 13 people crashed into the 3,200 feet mountain near the Cape Hallett Bay with 7 occupants dying on the spot. The crash was blamed on navigational mistakes that were made during the airdrop mission over the Antarctic. The Jenny was an English Schooner and a subject of a unproven legend. It is alleged that Jenny became frozen in an ice barrier on the Drakes Passage in 1823 and was only discovered in 1840 with the bodies aboard preserved by the cold in the Antarctica. The ship is said to have left its home port of Isle of Wight in 1822 and was discovered frozen in ice in the Drake Passage by Captain Brighton in September 1840. The captain of the ship had entered the log until January 17, 1823, the time the ship is estimated to have frozen, with the last call by the ship at Callao near Lima Peru. Seven bodies were allegedly found frozen in the ship. Eight tourists, a pilot, and a co-pilot were killed on New Year’s Eve of 1985. The eight were American tourists who had intended to spend New Year’s Day at the Chilean Air Force Base in Antarctica. The twin engine of the Cessna Titan 404, which had carried them from Punta Arena, crashed on Nelson Island killing everyone on board. Initial reports indicated that the plane lost altitude and crashed as it climbed to give the tourists a panoramic view of the area. Other reports suggested that the pilot made an approach to the landing strip but could not land it because of the fog. The pilot informed the base that he would be making another approach one more time before the communication was lost. Livingston Island is a South Shetland Island situated on the Antarctic Peninsula. It is a site of one of the popular plane crashes in the history of Antarctic. On September 15, 1976, an Argentine Navy aircraft flew on a reconnaissance of the area in order to survey the sea ice condition of the Drakes Passage. The plane crashed in poor weather on the island which was uninhabited. All 11 members of its crews perished. While the crash was detected almost immediately, an attempt to rescue the bodies was abandoned in January 1977 following the loss of one of the helicopters and the crew in the area. However, Livingston Island still remains a major tourist destination today. A South Korean trawler called Jeong Woo 2 sunk suddenly without warning off the Antarctic on December 27, 2010, killing up to 22 people. Two other Korean ships fishing in the area rushed and picked about half of the crew who had managed to take the lifeboat. Five of the crew members died immediately with 17 missing. It was hoped that the 17 had scrambled to the lifeboat but they could not be found after a whole night search. They were presumed dead as it was not possible to survive past 30 minutes in the icy water of Antarctic without protective gears. It was suspected that the ship might have been hit by either an iceberg or a strong wave. Air New Zealand Flight 901 was a scheduled sightseeing plane that was in use from 1977 to 1979. The plane left Auckland and took a few hours criss-crossing the sky over the Antarctic continent before returning to Auckland. On November 28, 1979, flight TE-901 flew into Mount Erebus on Ross Island killing 247 people including 20 crew members and 247 passengers. Initial investigations suggested that the accident was as a result of human error but a commission formed after the public outcry reported that the disaster was as a result of the changes made on the coordinates of the path of the flight the previous night before the disaster and the failure of the crew to be informed of the changes. The disaster remains New Zealand’s deadliest peacetime disaster. San Telmo was a Spanish gunship that was launched in 1788. In 1819, the ship commanded by Captain Joaquin de Toledo set out for Callao, Peru to reinforce the colonial army that was fighting the independence movement in Spanish America. However, the ship could not withstand the severe weather in the Drakes Passage. San Telmo eventually sank in September 1819 killing 644 soldiers, seamen, and officer. The wreckage of the ship was found months later by some sealers who were visiting Livingston Island. An island, San Telmo Island, located off the north coast of Livingston Island was named after the ship. Is Antarctica A Country? Who Owns Antarctica?